Software Ventures International is a pioneer in the Philippine IT offshore outsourcing industry. With a 30-year track record, our highly skilled, dynamic and creative global work team has enabled the Company to make its mark in the local and international IT industry as a reliable IT solutions provider. Our clientele includes companies engaged in a wide range of industries including telecommunications, transportation, pharmaceuticals, chemical, publishing, media, banking, insurance, manufacturing, energy, retail, healthcare and government. Adept at maintaining the Company’s books of accounts and preparing financial reports. Able to integrate the plans and budgets of operating managers into a financial plan for use by Management. Able to measure actual performance vs. budgets and devising measures to address variances. Able to generate reports to address reportorial requirements of Management, Board, Shareholders, and Government. Required skills(s): Oracle, MS Office. At least 5 year(s) of working experience in the related filed is required for this position. Preferably Supervisor/ 5 years & up experience employees specializing in Finance-General/Cost Accounting or equivalent. Plans and conducts complex studies to determine the cost of business activities. Recommends improvement measures and/or assesses revenue enhancing measures to improve profit. Prepares and reviews operating and financial reports of various business units to determine present and future financial performance. Create and develop proposal content that meets the specifications of the client within an established project timeline. Provides services such as technical writing, editing and proof-reading. Conduct research regarding client’s requirements to determine scope of the document and coordinate with SMEs on technical solutions and financial costing. Ensure proper proposal file organization and guarantee smooth delivery to all functions of the team and client. Develop and format proposals and responses according to proposal guidelines, with careful consideration of its accuracy. Take part in the oral presentation, discussion and final revisions. Acts as central point of contact in managing the end-to-end bidding process including process for determining pricing, site selection, capabilities with technology and processes. Develop and follows a comprehensive proposal plan that includes win strategies, customer requirement analysis, competitor assessments, themes/discriminators, risk issues, price-to-win analysis, and resource requirements. Candidate must possess at least a Bachelor's/College Degree, Business Studies/Administration/Management, Marketing, Journalism or equivalent. Extremely strong written and verbal English communication skills. Must be highly motivated and be able to adapt to various project environment. Experience in proposal development functions is an advantage. 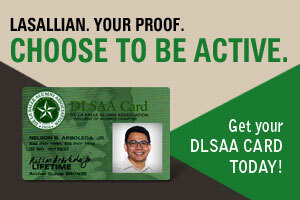 Applicants must be willing to work in Ortigas, Pasig. To develop concepts, graphics and layouts for magazine, brochure, logos, branding and related projects of the company. Candidate must possess at least a Bachelor's/College Degree in Fine Arts or equivalent. With good scholastic record. 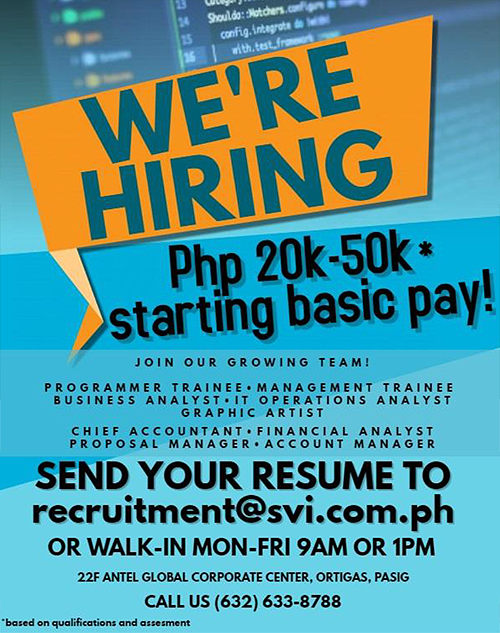 SVI is currently looking for Programmer Trainees who will be trained for 2-3 months with different programming languages. The company will offer training and in return, trainees must stay with the company in a certain period. They will be required to stay with the company for 2 years. Involved in the analysis, planning and implementation of new or enhanced system in order to optimize business processes and improve systems usage. Analyze business issues, recommend possible solution, and work with Business users and IT team for the actions needed to resolve the problems. Work closely with the IT teams and Business teams to ensure successful implementation of the requirements and that it meets the business needs. Candidate must possess at least a Bachelor’s/College Degree in Computer Science/Information Technology, Engineering (Computer/Telecommunication) or equivalent. Must have performed or familiar with information analysis, systems analysis and design, business process engineering. Candidate must possess at least a Bachelor's/College Degree in Management Engineering. Must be able to communicate in English, both in writing and verbally. Steps in the recruiting and hiring process, including: posting job openings, provincial campus job fairs, reviewing resumes, conducting telephone and in-person interviews, making job offers and negotiating starting salaries. Employee benefits management issues related to plan renewal and open enrollment, benefits enrollment, and the customer service aspect of benefits oversight. Candidate must be currently pursuing a Bachelor's/College Degree in Human Resource Management or equivalent. 6 Internship position(s) for duration of 5 month(s).